Middle-schooler Lance Teeselink wants to grow up to be a skyscraper architect. The problem for Lance is that he lives in Iowa – a very flat place with only low buildings. It’s not easy for him to see what a skyscraper really looks like. When Lance’s school teamed up with Google Expeditions, they took his class on an extraordinary school trip. Instead of getting on a bus, pupils put on a cardboard virtual reality (VR) headset to explore the world. Their first stop? Burj Khalifa in Dubai. While experiential learning is a valuable part of education, schools are often limited in providing experiences that may be too far away, too expensive or too dangerous. VR is a chance to take kids on exciting trips without leaving the safety of the classroom. 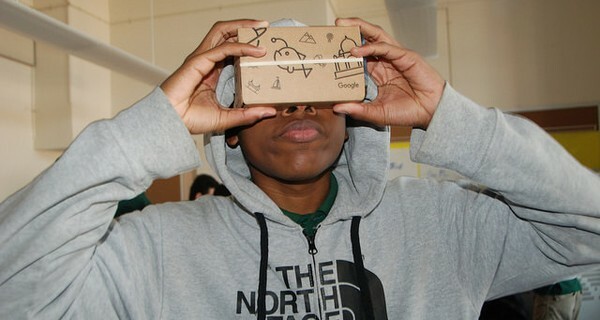 Using cheap cardboard headsets that keep the costs low, as well as Android phones and a teacher-operated tablet, Google Expeditions lets students experience 360-degree views of anywhere from Machu Picchu, to caves in Slovakia, and even the International Space Station or the inside of the heart. The app is designed for both teachers and students. Teachers choose the ‘lead’ or ‘guide’ option, while students choose the ‘follow’ or ‘explorer’ option. Kids can explore the location independently, or follow the teacher, who can provide guidance and commentary on different elements. Since teachers don’t wear a headset, they can still keep an eye on everyone in the class. The Expeditions programme launched last year, and Google says over a million students in 11 countries have been on virtual trips to over 200 destinations. It has also partnered with education content providers like Pearson and TES and says it will make the app available on iOS. For now, you can download Google Expeditions for free on Google Play.